The materials displayed at this and every other miniature museum in The Souls were in glass-covered pedestals and vitrines, except in one case, The Museum of European Normality. 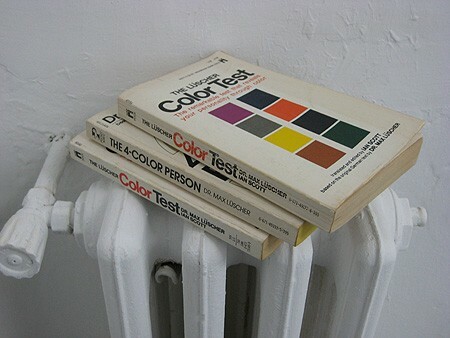 Above, at the The Museum of Projective Personality Testing, some books appeared to be testing exhibition scrutiny. “We live in a culture so saturated with tests—administered by schools, corporations, the military and hospitals, amongst others—that we have come to believe that we can only know ourselves through the mechanics of examination.” This is the start of the introductory wall text of The Museum of Projective Personality Testing. Created by Cabinet magazine editors Sina Najafi and Christopher Turner, this museum includes a collection of early “projective” personality tests. Some are rare, and most extinct. Goethe-inspired color tests, Rorschach diagrams, and cartoon-illustrated image plates, were among the devises used in these kind of psychological exams, which were (still are) thought to project the unconscious. This miniature museum looks at how psychoanalysis and, eventually, objective rather than projective testing replaced these earlier attempts in the study of human behavior. The Museum of Projective Personality Testing was one of five mini-museums that were part of the exhibition The Soul curated by Anselm Franke and Hila Peleg. The Soul, in turn, is one of the four exhibitions that makes-up the current edition of Manifesta 7. The current edition of this itinerant biennial is hosted in Italy. Invited by the exhibition curators to sketch an imaginary museum of sorts, Sina and Christopher’s mini-museum responds to a curatorial premise that inspired by a historical event of a religious order, literally. Anselm and Hila looked into the sixteenth century, when Trent was host to a religious council who determined that, in the Roman Catholic Church, imaginings, wishes and desires were subject to confession as if these were performed actions themselves (The Council of Trent, The Bull of Indiction, Chapter V). Read The Soul curators talk on this subject, and about their curatorial process in general, here.